Nottoway Indians live a contemporary lifestyle and we are not frozen in the past. While our community is working tirelessly toward maintaining practices that are rooted in the past, we are diligently working to apply those practices that define our place in contemporary society. Nottoway culture allows our people to deal with the realities of contemporary society, not by embracing a new fad, but continuing to absorb new traditions on our own terms. Like other Nations across Indian Country, Nottoway people are striving to maintain our culture. Suffice it to say, culture is not just the remnants of the past, but also patterns of thought, and cycles of behavior that shape the basic building blocks of Nottoway life. We the Nottoway, are eternally grateful for the untiring efforts and sacrifices of one of our past leaders-Wané Roonseraw. Wané Roonseraw, born circa 1754-1838 who took the English name Edith Turner (Edy Turner) was a renaissance woman of the 19th century in Southampton County, and on many occasions she was referred to as “Queen” or “Chief.” On one account, Turner was depicted as an astute business woman. Although Turner was not a learned woman, she was described as highly intelligent and a skillful conversationalist. In addition to her ability to have had the command of the English language, she was also fluent in her native tongue which was the Nottoway language (Morse, 1822). In fact, in 1820 former President Thomas Jefferson dispatched Wood who as a professor at the College of William and Mary to record the Nottoway language (and word list which contains over 200 words) as dictated to Wood by Turner. Later it was determined by DuPonceau that the Nottoway language was of an Iroquoian language stock (American Philosophical Society, 1820). Through the distressing years of our history, the strong willed Wané Roonseraw (Edy Turner) was faced with many disturbing issues. For example, she was faced with providing a safe haven for Nottoway children who found themselves as orphans, and she fought diligently to maintain the Nottoway culture for those who were to come after her. Additionally, Turner argued that by Treaty rights Nottoway children were to stay on the reserve and they were not to serve as apprentices or indentured servants to Caucasian planters in the surrounding communities in Southampton County. Prior to the turn of events for the Nottoway, 19th century America was a tempestuous period for American Indians. For example, many Indians were forced from their sacred lands via the Removal Act of 1830 which was led by former President Andrew Jackson (U.S. Department of State, n.d). The Nottoway people were not affected by the Removal Act of 1830; however, the Nottoway who had inhabited their sacred lands in Southampton County for many years found themselves pressured to accept the economic system, political, and religiosity of the dominate culture of that epoch. 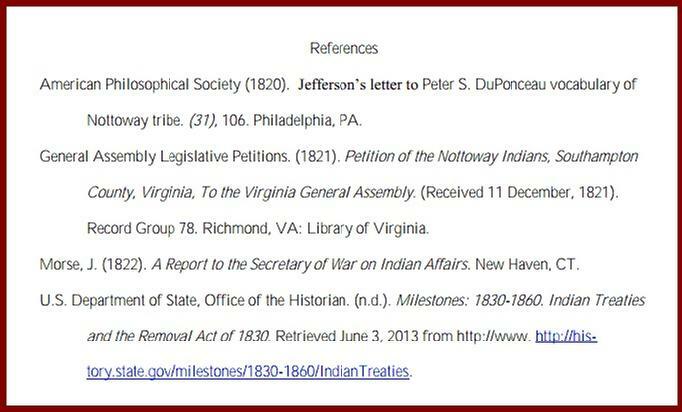 Consequently on October 27,1821, Turner petitioned the Virginia General Assembly as “Chief” of the Nottoway people (General Assembly Legislative Petitions, 1821) to distribute the remaining segment of the initial 44,000 acre Nottoway Indian Reservation into individual descendant ownership allotments. 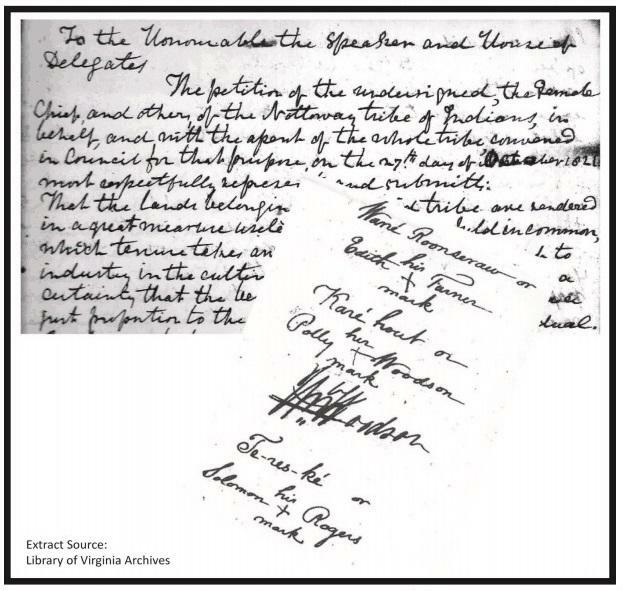 Exhibit 1 is a photocopy of the original Petition of the Nottoway Indians, Southampton County, Virginia, to the Virginia General Assembly on October 27, 1821. One may consider this action as the last resort for Turner and her people. Nevertheless, being politically savvy and a shrewd business person, Turner assumed allotting portions of the reserve was perhaps the only means to evade the involuntary ejection of the Nottoway people westward. Furthermore, it is important to note that other historical Indian Nations found the Nottoway reserve as a safe place of refuge in their time of trouble and need. As a social activist, politician, and business person, Wané Roonseraw (Edith Turner) was a progressive thinking woman of her time, and she was a powerful force to have been reckoned with in 19th century Southampton County. Today as 21st century Nottoway people, Turner's fighting Iroquoian spirit continues to dwell within us. Nuwaswekum translation-“They speak, it is their role”. Therefore, it is the role of Nottoway people to speak the truth, and speak of our rich historical past, present, and future for the next 7 Generations.